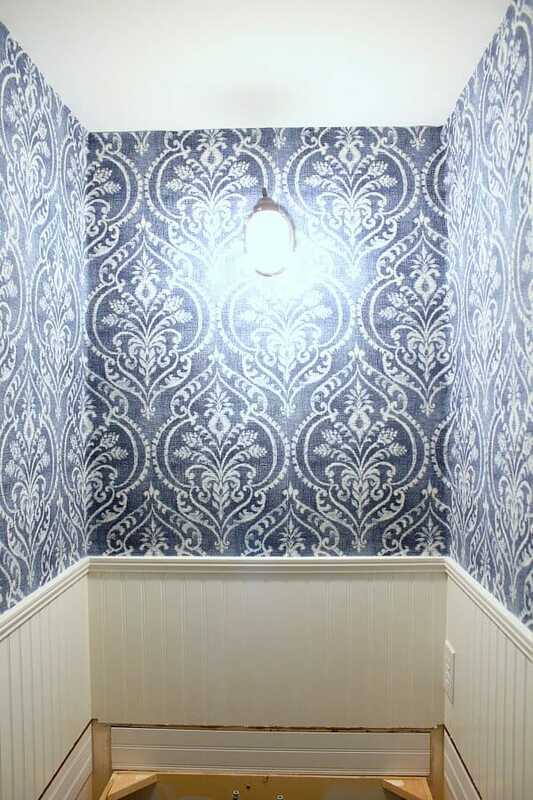 Wallpaper is so popular right now, but I’m not a fan! 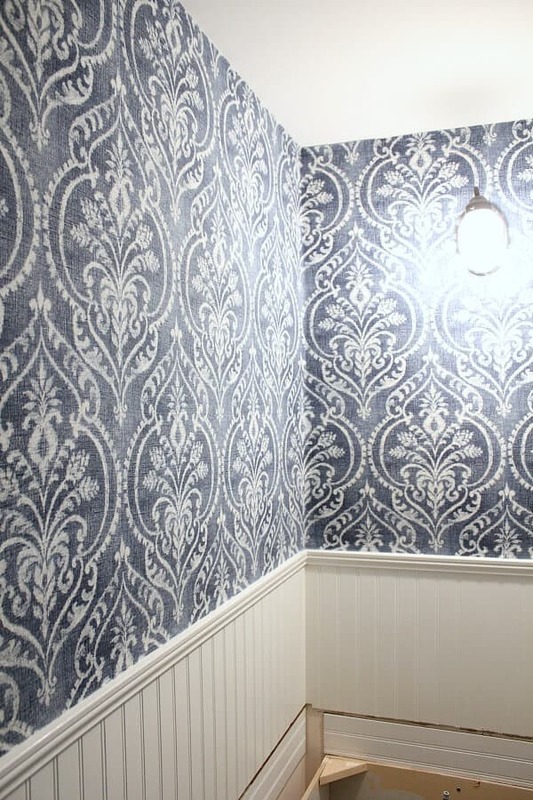 After pulling off the many strips of old wallpaper in our 80s fixer, I was hesitant to add it back again. 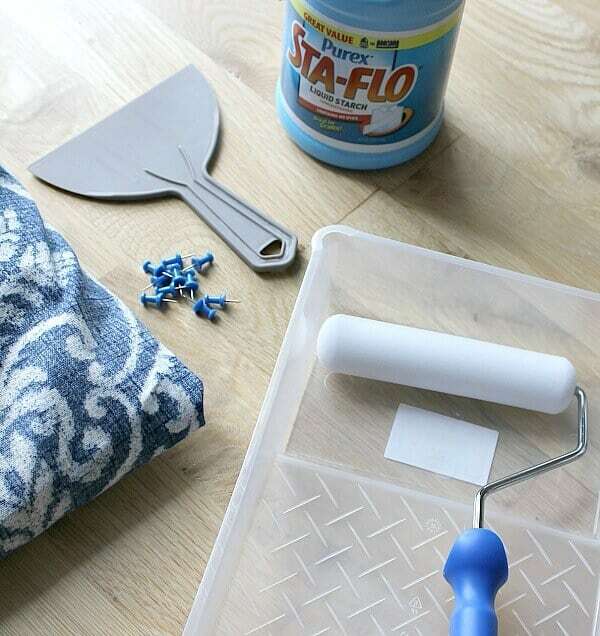 I found an easy solution to get the look I wanted without all the stripping mess when time comes to take it down. Because, as you know, I’m always wanting to switch things up. 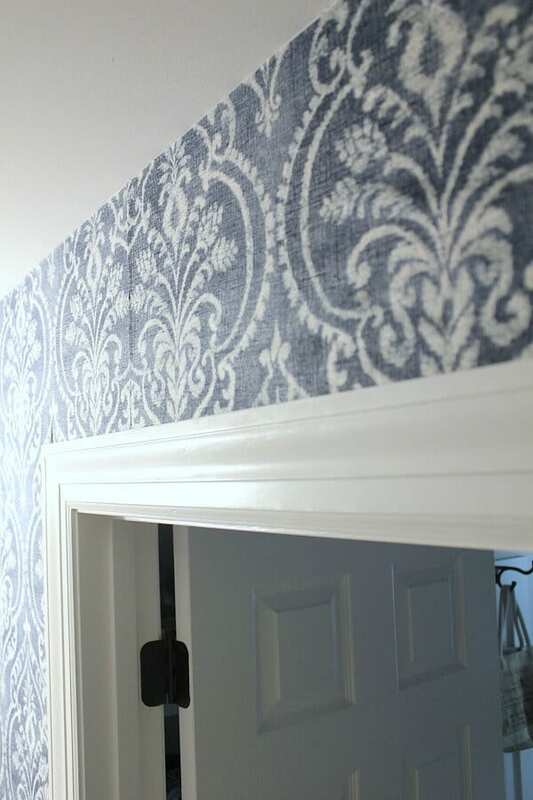 This temporary wallpaper tutorial is the perfect solution to get the gorgeous wall coverings I wanted. This just may inspire you to do the same! 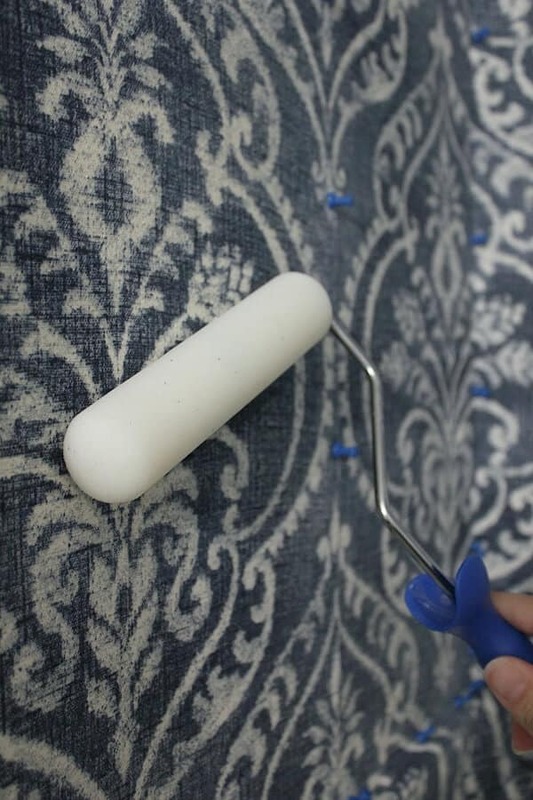 Here’s how we took fabric and a bottle of liquid starch and transformed it into wallpaper. Here we are in week 4 of the One Room Challenge, hosted by Calling it Home and House Beautiful Magazine, and I have to say I’m a bit surprised. Historically, week 3 and 4 have been the tough weeks to get through, and so far, no issues or hiccups have occurred. First, lets start with the supplies. Affiliate links are provided for your convenience – at no cost to you! Read my full disclosure here. 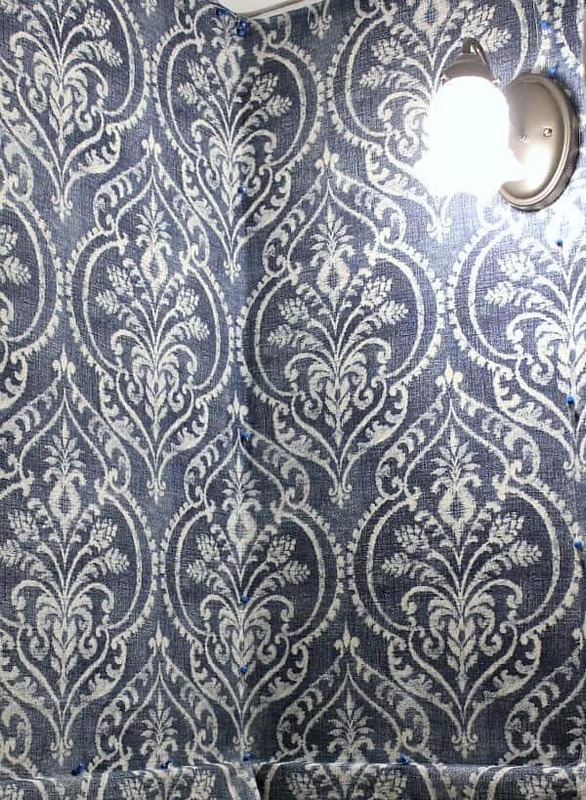 Fabric – I used Swavelle/Mill Creek Dalusio Damask Denim I ordered from Fabric.com. 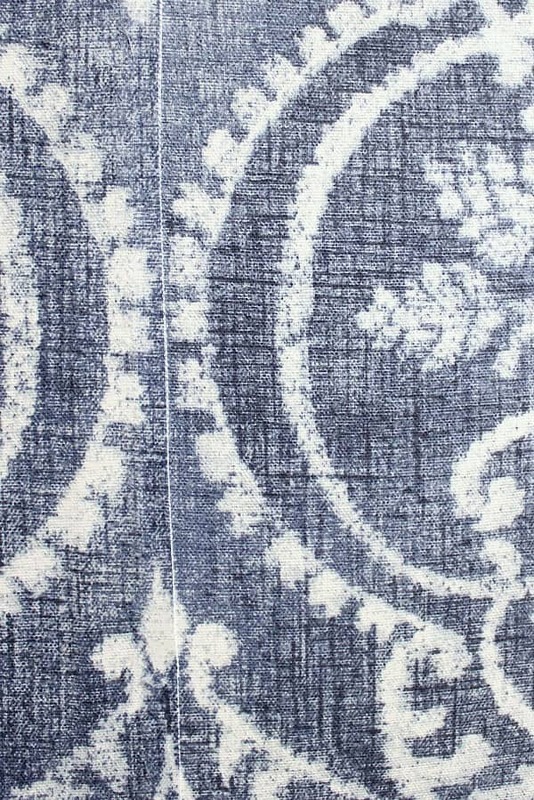 I ordered 7 1/2 yards for our half bath which is 3 ft x 7 ft. Step One: How Much Fabric? The first step is to determine how much fabric you need. 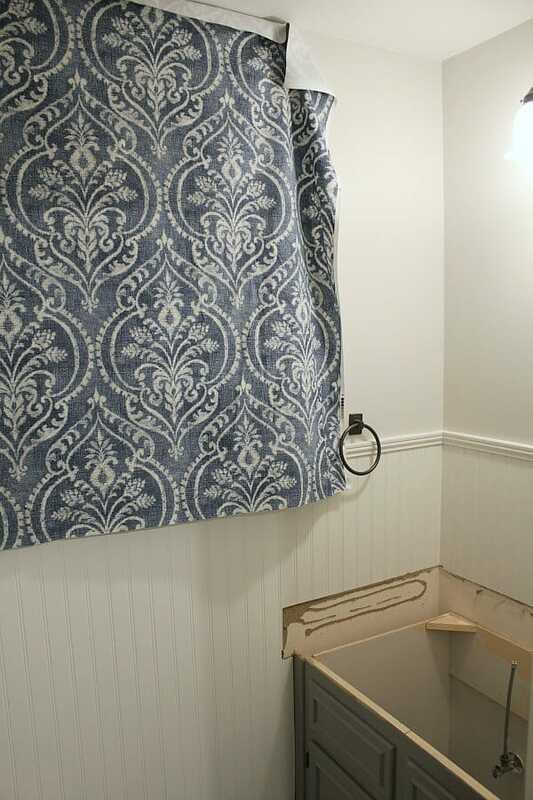 For my half wall, I needed 42 inches of fabric from the ceiling down to the top of my beadboard. *Important! * When you are figuring how much fabric you need, be sure to factor in for shrinkage. I added 6 inches to the top and bottom that you will trim off. As the starch dries, it will shrink! For my, this is how I calculated the amount to order. = approx 4 1/2 panels needed. I was able to get a great price for my fabric so I ordered an extra yard in case of any goofs that might happen! The fabric I ordered arrived last week and I’m in love with how it looks! This was the tricky part for me. Trying to avoid a seam in the view from the door, no matter how I worked around the light fixture, the seam was visible. I must have moved that first panel a half dozen times until I finally gave in! Total aside: we finally took out that ugly old countertop! We have the countertop removed and the new one cut , ready to get stained! But I’ll share the details on that process next week! First, you pour the starch in the tray and roll, or size, the walls with the liquid starch. Just note that this can get messy. Liquid starch is not the same consistency of paint and splashes and drips will happen. I kept a towel handy to catch any drips or splatters. I started with my first seam running in the center of the light fixture. This made cutting around that fixture a breeze! Working in small areas, you simply secure your panel with push pins to the wall. My fabric was cotton and will hide the pin holes very easily. I placed the pins about 6 inches apart starting at the top. The next step is to roll the fabric with the liquid starch, smoothing the fabric as you go. I started at the top and worked my way down, adding push pins along the way. Continue working in sections until each panel is hung. My tricky area was over the door where the patterns didn’t match up. It took some thinking and extra cuts until I was able to figure it out. This is why you need to order extra fabric! Then, you let the fabric dry overnight. Or you can be like me and continually babysit it to see how it’s doing. I finished at around 4:3o one afternoon, and kept going in and out until bedtime! Without a doubt, a fresh razor blade is a must for this step. I took a metal spackling tool to create a sharp edge to run the razor against. Another tip is to have a folding blade, especially when you are working with a ceiling line. I almost toppled at one point and was quite thankful that the blade was not open! The fabric easily pulls away, leaving a fresh, clean line. So wanna see how it looks??? What a transformation! 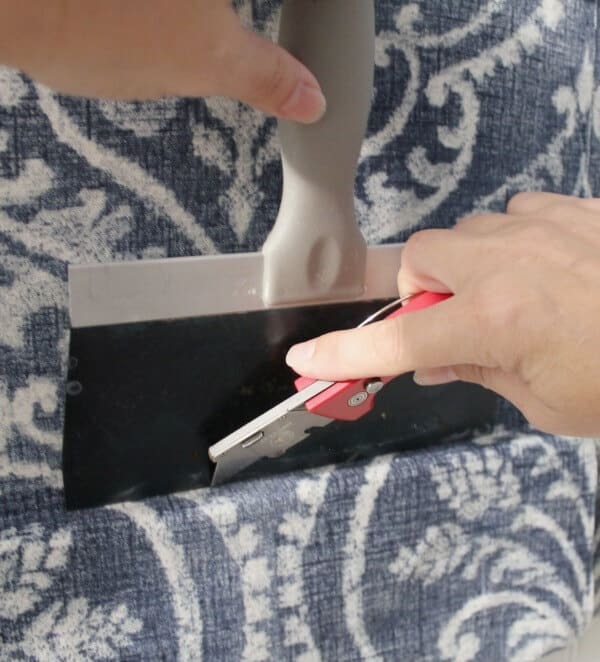 Taking only one day to install, this is undeniably an easy DIY. But all DIYs have their problems. There were a few issues that I came up against. Bubbling: After the fabric and starch dried, I noticed a few areas didn’t quite adhere. I simply rewet those areas and rolled more starch, then smoothed them out with my metal tool. It took the bubbles away! Corners: Even though I pinned the corners of the fabric where the two walls met, it still pulled away in some places. The rewetting technique didn’t quite work, so this is something you need to do before it dries to really ensure that there is a crisp line in the corners. Luckily this happened over my sink, so it not really a touchable area and my pattern hides it. Pattern: If you have a pattern, step back often to make sure you are still lined up. 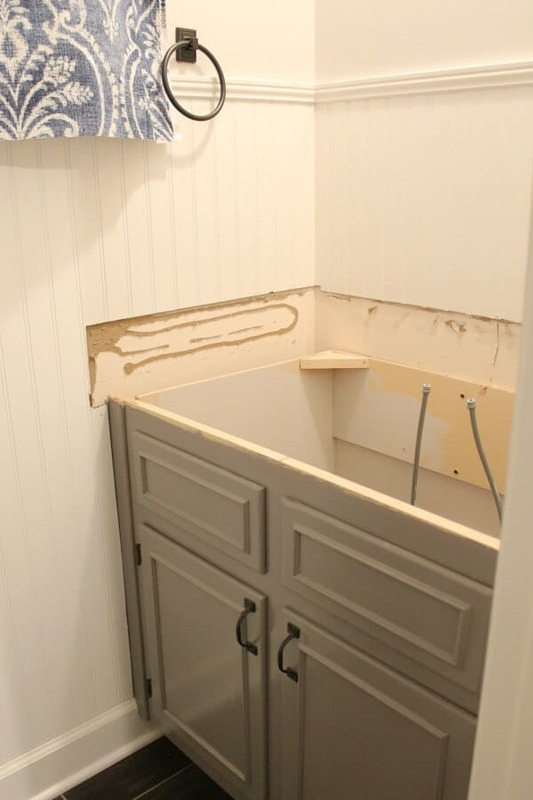 I had to remove one panel because my pattern didn’t line up with my beadboard. A ruler may be helpful here. All in all, I love my temporary fabric wallpaper! I especially love how instantly warm the room feels – which is tough to do in a bathroom! Even though the seam falls in the middle of the wall, it doesn’t bother me. It’s barely noticeable unless you are really looking for it! Replace Faucet – $50 – arrived! So far so good for being on budget! Since we are working with limited funds, every penny counts. Be sure to come back next week to see our progress on the countertops. I’m off to check out how everyone else is doing on this challenge over at Linda’s link up. 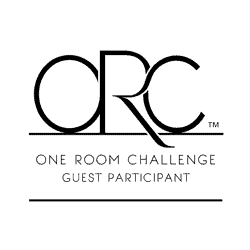 You should visit as well – loads of inspiration! I love it! The fabric you chose is beautiful. Jen I don’t know about temporary. This looks incredible. And yes it really does warm up that room. 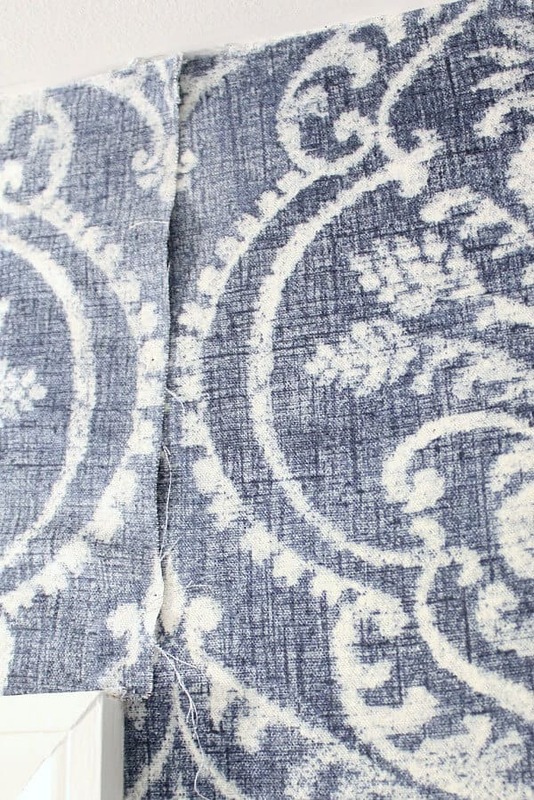 Love the beautiful pattern on the fabric. I would leave it on forever! This came out fantastic. And so much better than wallpaper since it will be easier to remove. First, I am so impressed with your skills! I don’t know if I could attempt this! Second, I LOVE that fabric! It is so perfect in there and I cannot wait to see the whole room come together! Great job! Thanks Debra – my thoughts exactly! I’m thinking the same Mary – it’s so beautiful – it may be there for a while! This looks lovely. I’d rather do this than the wallpapers. Thanks so much! I think the temporary works great for those who aren’t wanting to commit to permanent wallpaper that’s difficult to remove. Thanks so much for the invite, Jodie! I added you to my party list! Wow, this is absolutely gorgeous! What a great idea! Wow! I am totally in LOVE! I love a bold color or bold pattern in a tiny room. I love your choice of fabric too. Thanks Nikki! You are such a sweetie! This looks beautiful! Perhaps if someone wanted it to be permanent they could spray a little adhesive on the walls too. 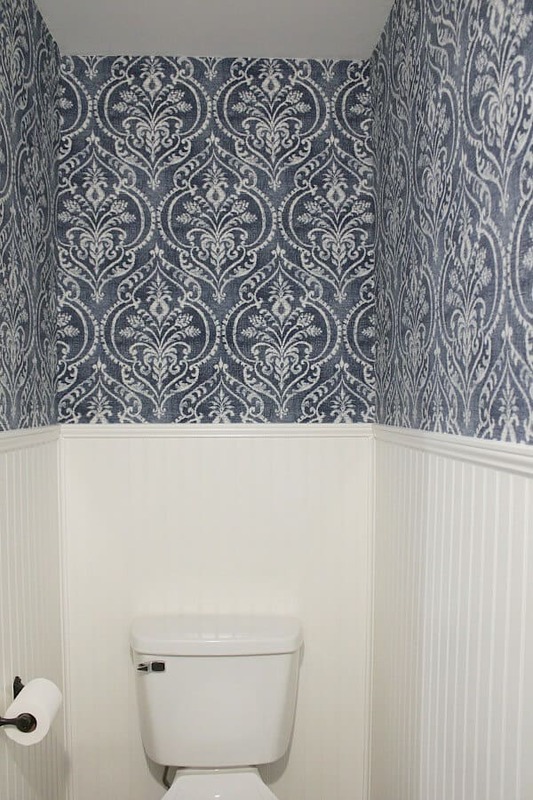 This is a very tempting idea for my powder room makeover. 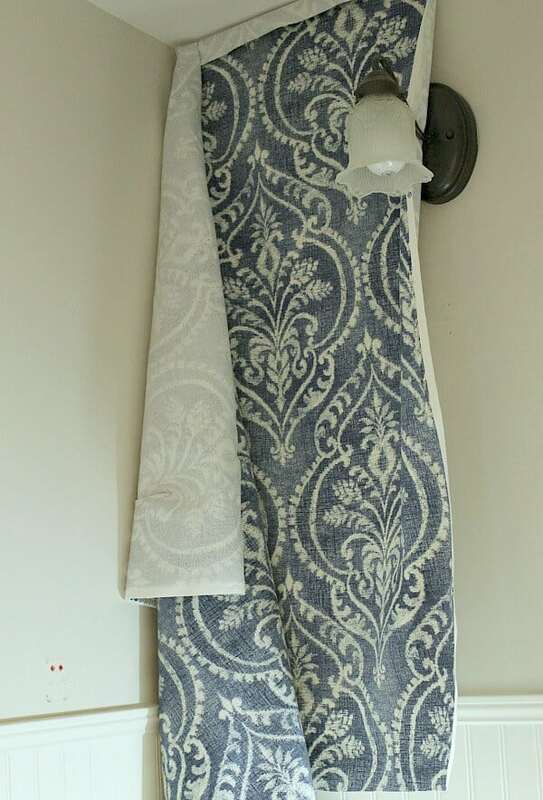 That fabric is so pretty & love the bathroom walls with it. Sorry I’m just getting over here to comment Sharing & Pinnned Thanks for joining the Inspiration Spotlight party @DearCreatives.. Thanks so much Theresa! Always love linking up! That’s a great suggestion too! Thank for stopping by Elena! This is so pretty! I love this! Thanks for sharing with Thursday Favorite Things! 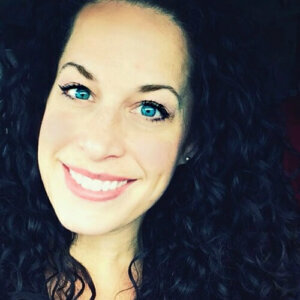 So happy to have you join us! Angelina @ Petite Haus. Thank you Angelina! I loved linking up! 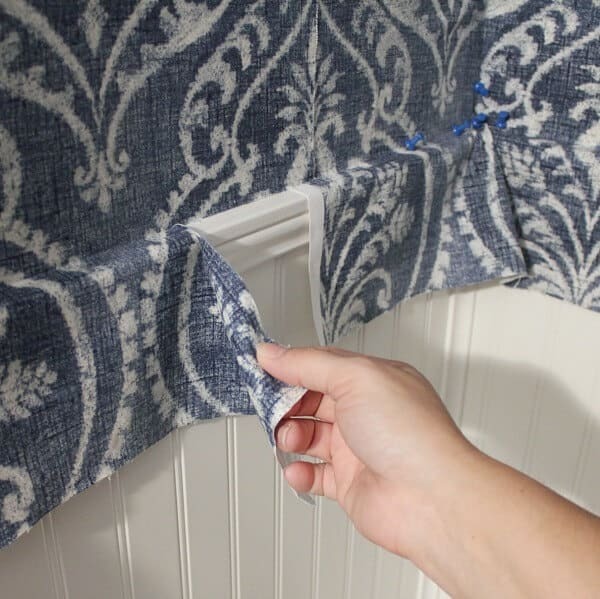 Wow, I had no idea you could use fabric on walls! An love the choice of fabric too. Thanks for sharing with our link party! Thank you Stephanie! I always love linking up! What a genius idea! Thanks so much for linking at To Grandma’s House We Go link party! Your project has been pinned. We hope to see you again this Wednesday! Temporary in the way it can be removed. It’s sealed on there well, but since it’s just starch, it can easily be pulled off when you want to change it out. We’re in middle Tennessee and it’s pretty humid here as well. So far so good! Hope that helps! Always love linking up Carrie! Thanks Susie!! you are so sweet!